We employed our rigorous workflow-based methodology to address safety issues of intra-hospital transfers. Particularly, we devised a framework for systematically generating electronic checklists for healthcare processes, and we applied it to intra-hospital transfers for tracheostomy procedures at St Mary’s Hospital, London. The resulting checklists are guaranteed to reflect the transfer workflows, enforce consistency and completeness, and thus provide enhanced confidence when it comes to patient safety. Intra-hospital transfers in the UK do not have well-defined guidelines, leading medical staff to employ informal, mostly oral-based means in order to support the transfers. These ad-hoc procedures are prone to errors, omissions and miscommunication, thus leading to an increasing risk to patients’ safety. Health practitioners at St Mary’s Hospital, London, have recognised the need for formalising these informal procedures and have sought a computer-based solution that allows their modelling and can ultimately support staff throughout different stages of intra-hospital transfers. We have employed our methodology for modelling, verifying and deploying healthcare workflows to formalise intra-hospital transfer procedures and systematically devise checklists to support them. Focusing on intra-hospital transfers for tracheostomy at St Mary’s Hospital, we have conceptualised, formally modelled and rigorously composed the processes involved, which are then realised as electronic checklists. Working closely with our medical collaborators at St Mary’s Hospital we decomposed the intra-hospital transfers for tracheostomy into a set of smaller processes. In order to gain a good understanding of the transfers, we shadowed the on-call theatre coordinator and anaesthetic consultant and held a series of contextual interviews with the medical team and support staff. These helped clarify concepts and important questions, thus enabling us to continuously improve the transfer conceptualisation. The iterative nature of this phase is shown in Figures 1 and 2, as well as Table 1. 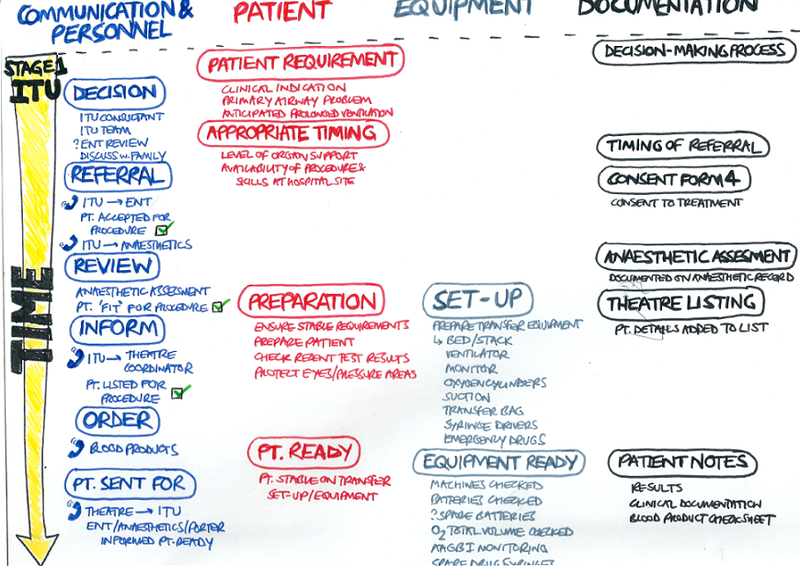 The medics first provided us with notes on the transfers (Figure 1), and then they were encouraged to produce hand-sketched flowcharts that further refined the procedures across several dimensions (Figure 2). These enhancements helped us identify the processes involved, along with their inputs and outputs (Table 1). With the use of our visual tool we then modelled the tracheostomy transfer processes. As the visual modelling occurred, the logical specifications of the processes were constructed automatically in the underlying logical engine. 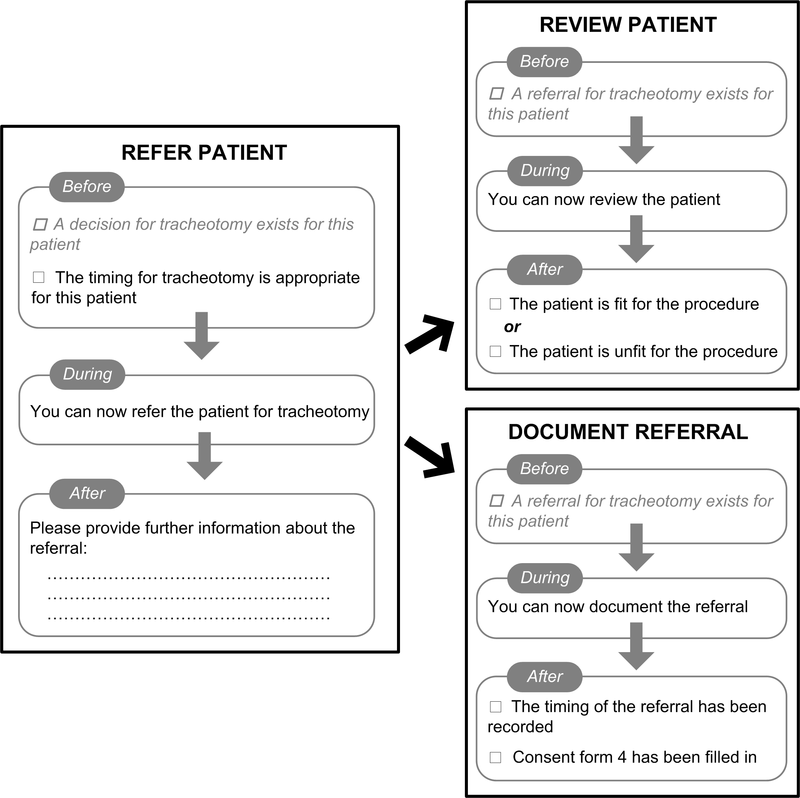 Figure 3 presents an example of the formal specification of the process “document referral”, illustrating both its graphical representation and its logic-based definition. The overall tracheostomy transfer workflow was then rigorously composed fully graphically, providing us with a visual representation of the transfer flow that was backed up by mathematical proofs. An extract of the developed workflow is shown in Figure 4, illustrating the sequence of steps at the pre-transfer stage. 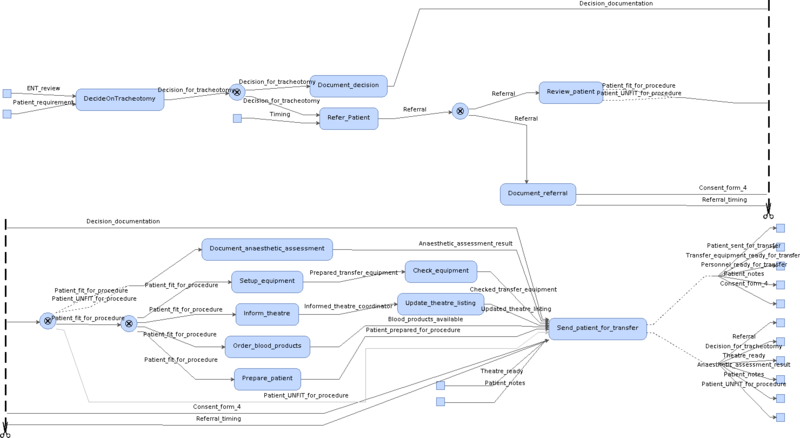 The resulting workflow clarifies the progression of the transfers, visualises the flow of resources and makes evident the dependencies between different processes. 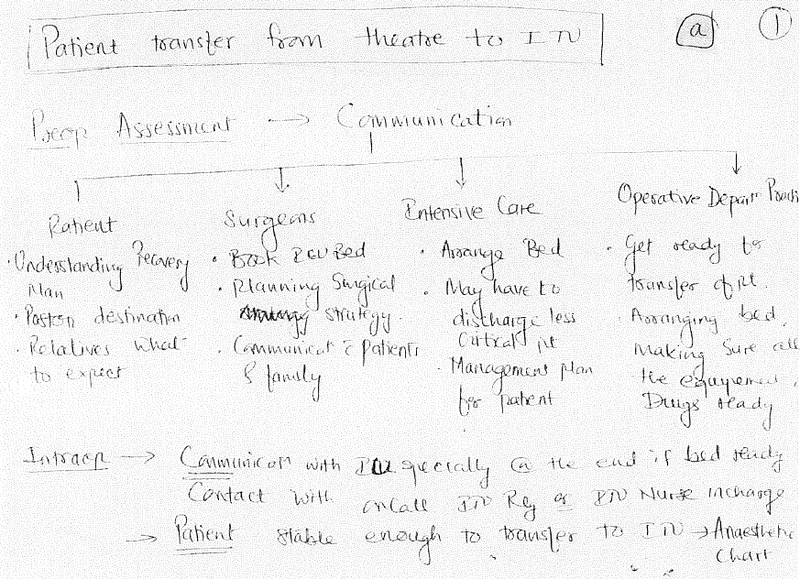 Our medical collaborators found the composed workflow to be valuable, as it effectively addressed their need for formalising the tracheostomy transfer procedure. More importantly, it provided them with guarantees that the followed procedure was essentially correct, as no inconsistencies were found during the mechanical verification of the composition. Finally, electronic checklists were devised to reflect the constraints and requirements of tracheostomy transfers. These checklists were obtained through a systematic translation procedure of the formally verified transfer workflow. Figure 5 presents an extract of the tracheostomy transfer checklists, illustrating the prescribed sequence for filling them in. The generated checklists are guaranteed to reflect the transfer workflows and enforce relevant hospital policies, thus providing enhanced confidence when it comes to patient safety. They are also fully maintainable, a property that is valuable in the highly dynamic environment of medicine and healthcare.